World famous illustrator, Quentin Blake, who is perhaps best known for his illustrations in books written by Roald Dahl, is leading the rally to raise money for a new centre that will be dedicated to the art of illustration. Blake has been encouraging fellow artists and illustrators to submit their original works of art for an auction which is to be held at Sotheby's in London, this December. Amongst the illustrators set to participate in the auction are Raymond Briggs (The Snowman), Eric Carle (The Very Hungry Caterpillar), Ronald Searle (creator of St Trinians) and Gerald Scarfe (cartoonist for The Sunday Times and The New Yorker). Around 28 drawings are said to be going on sale to raise money for the House of Illustration, which will feature as part of Sotheby's winter sale of English Literature, History, Children's Books and Illustrations on the 16th December. A particular work of note from those going on sale is an original illustration of the butterfly from his famous book, The Very Hungry Caterpillar . Pre-sale estimates suggest that the work could sell for around £3,000 - £5,000. Blakes work doesn't just stop at getting artists and illustrators to join in with the auction; the 77-year old has been integral to the House of Illustration project as a whole, which will be housed in the King's Cross area of London. 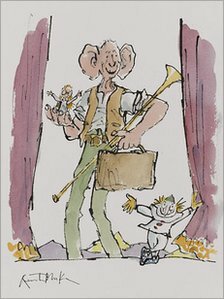 Blake himself has donated a watercolour of the BFG character for the auction, which is perhaps one of the better known characters from the stories of Roald Dahl. All of the illustrations that have been donated will be on view at Sotheby's from the 12th December.